Association Member Talisman Hire is to play an important part in the UCI World Mountain Biking Championships taking place at the Cascades Mall Mountain Biking Track in Pietermaritzburg this week. Mountain biking professionals from all over the world will be showcasing their skills by launching themselves off the back of a Talisman delivery vehicle, onto the top bar of a JCB 1.2 tonne roller. The cyclists then jump half a metre onto a 2M high scaffolding structure provided by Talisman Hire, specifically designed and built for this event. The UCI World Championships is expected to attract crowds exceeding 15 000 and offers must see coverage on SuperSport and SABC. 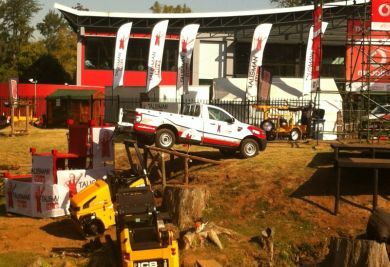 This sponsorship has been a welcomed opportunity for the Franchise Group who opened their Talisman Pietermaritzburg Branch in March of this year and has since introduced JCB 900, 1.2 and 1.6 tonne JCB rollers into their fleet.